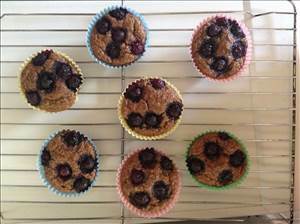 Flaxseed and almond flour muffins, gluten and sugar free little bundles of loveliness. These muffins satisfy a sweet craving and will tide you over to your next meal. Preheat the oven to gas 4. Melt the coconut oil in a glass bowl in the microwave, about 1 1/2 minutes and beat in the eggs. Add all other ingredients apart from the blueberries and use a hand whisk to mix well. Divide mixture between 7 small muffin paper cases and top with about 5 blueberries each and gently press them slightly into the mixture. Put in the middle of the oven for about 20 minutes. 47 members have added this recipe to their cookbook. There are 194 calories in 1 serving of Blueberry Cinnamon Muffins. Calorie Breakdown: 68% fat, 18% carbs, 15% prot.